Only a quarter of Britons are aware that Jesus was born out of wedlock while some even believe that Father Christmas was part of the nativity scene, a survey has found. While many could be forgiven for confusion over Mary and Joseph’s exact marital status, the study also highlights more unexpected gaps in the nation’s knowledge of the Christmas story. Scores of people tested thought Jesus was placed in a Moses basket rather than a manger. Despite nativity plays commencing in schools across the country, it seems many people struggle with the storyline of the birth of baby Jesus. 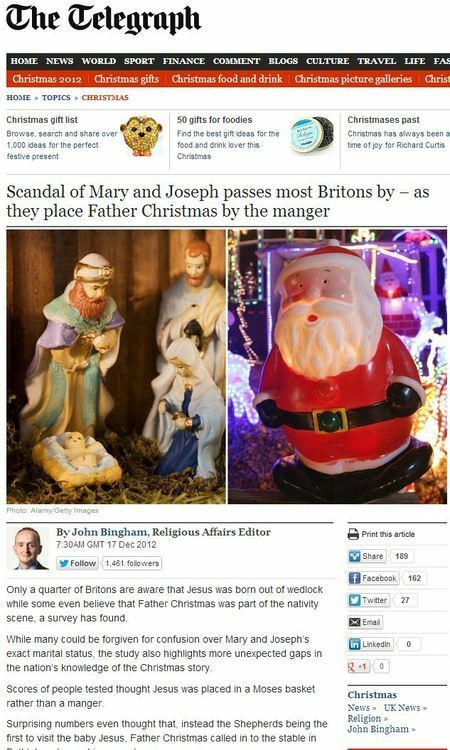 A majority of Britons appear to be unaware that Jesus was born out of wedlock and some believe that the first person to visit the manger was Santa. Only 26 per cent knew that Mary and Joseph were betrothed when asked about the story of the birth of Christ, a survey revealed. When asked who first visited the baby Jesus, only 46 per cent correctly identified the Shepherds while almost as many thought it was the wise men, and 13 per cent suggested angels. In total 37 people thought that the answer was Father Christmas. In fact, the supposed 40% of people as reported in the Mail was actually fewer than 40 people in total. Of which, many are likely to be children. Which makes a lot more sense, I’m sure you’ll agree. Leaving aside the very real doubts over the nativity story as described in the gospels – such as the inclusion of a census, stable, shepherds, and in fact any proof that Jesus existed – is there a reason why we might suspect there’s more to this story than it seems at first? Like, say, an undeclared invested interest biasing the results? 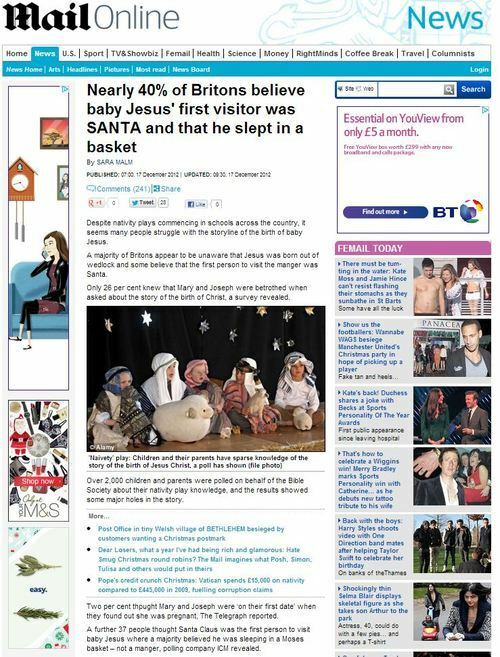 Over 2,000 children and parents were polled on behalf of the Bible Society about their nativity play knowledge, and the results showed some major holes in the story. So the Bible Society, in the same week that statistics show there are fewer Christians in the country than expected, thinks children know too little about the Christian holy book. Go figure. This entry was posted in Bible Society, Christmas and tagged Ann holt, Bible society, christmas, daily mail, john bingham, Sara Malm, telegraph on December 17, 2012 by Michael Marshall.